Berlin-Brandenburg's InfoTower with its innovative architecture. The current airport facilities at Tempelhof, Tegel and Schönefeld are inadequate for future projected air traffic to the city. Tegel and Tempelhof cannot be expanded as they are surrounded by urban areas, leaving Schönefeld Airport in south-east Berlin as the only option for the expansion of airport facilities. Berlin City Council has taken the stance that the completion of new airport facilities is a matter of need as well as of prestige. The only option being to expand Schönefeld Airport to form the new Berlin Brandenburg International (BBI) Airport, which will be capable of handling all of Berlin’s air traffic needs, and to close Tegel and Tempelhof. The plans for BBI, which will result from the expansion of Schönefeld by 970ha to a total area of 1,470ha, were first put forward in 2000 but due to legal and financing problems were delayed. An amount of €2.4bn is being invested and additional investments are being made to develop the roads and railway connections to the airport. 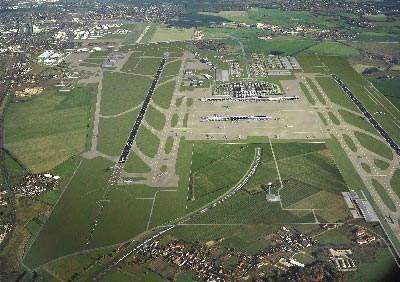 The development of an airport city and business park is also being planned. The overall cost of the project will amount to €3.6bn. In October 2008, the government put forward guarantees to fully secure the whole amount of the €2.4bn loan to build the new BBI airport. The official construction permit for the airport expansion at Schönefeld was granted in 2003. Following that, the finance was finalised and detailed planning and preparations were made for the construction. The main obstacle for the construction starting properly was a court case regarding the expansion, which was finally heard in the Bundesverwaltungsegericht (German administrative court) in February 2006 as part of a test case for the Transportation Route Planning Acceleration Act. 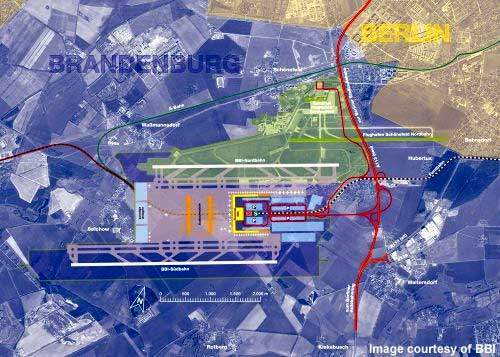 In March 2006, following a ten-year administrative court battle, the Bundesverwaltungsegericht in Leipzig gave the go-ahead for the project by ruling in favour of Berlin-Brandenburg against challenges by residents and municipalities near the future airport. There was no appeal allowed against the decision and compensation was set along with restrictions on night flights. Construction started in early September 2006 and the airport was scheduled for completion by late 2011. Delay in construction work has pushed the opening date to March 2013. When the airport opens it will be called as BER and will have the capacity to handle up to 27 million passengers a year. 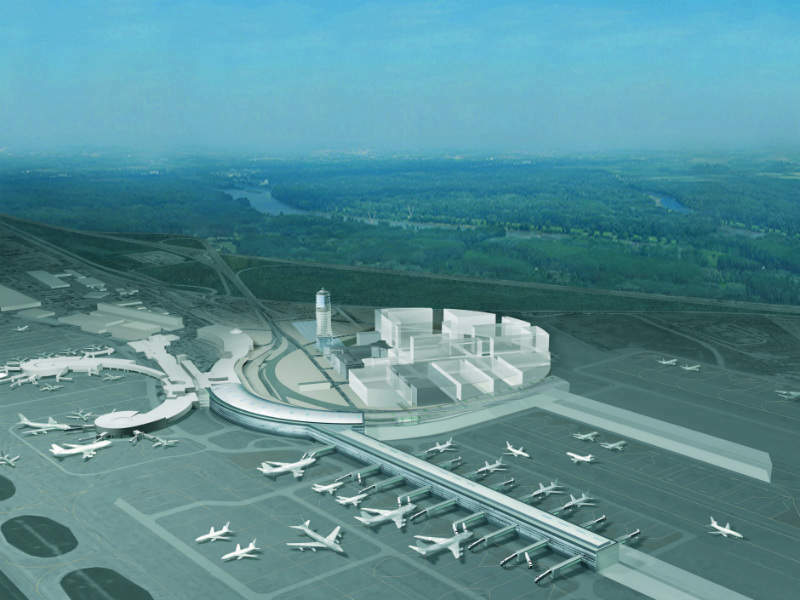 Depending on the passenger development, the airport can be expanded modularly for up to 40 million passengers. Tempelhof Airport closed on 30 October 2008 (two years later than previously agreed and amongst a storm of protest), while Tegel Airport will be closed in 2013. Protesters demanded that Tempelhof stay open but the airport only had 300,000 passengers in 2007 and cost €9m ($11.2m) to run each year. The site, with the listed terminal building, can now be used for a new park, business centre or eco city. The Berlin-Schönefeld northern runway was closed and demolished in mid-2008. The existing southern runway was lengthened from 3,000m to 4,000m, and a completely new runway constructed south of the new BBI Terminal. This provides the airport with two parallel runways with a midfield terminal building to save space. The extended runway is 60m wide and is equipped with an early warning system for ice which offers better security in bad weather conditions. The airport is equipped with gates, runways and taxiways capable of handling even the largest superjumbos such as the new A380. The airport will also be integrated into a new road and rail infrastructure to allow good communication and short travelling distance to the centre of Berlin and the rest of Germany. Transport facilities include a direct motorway connection to the A113. The contract for the road was awarded to Porr Deutschland and Matthai Bauunternehmen in October 2007, and includes a 700m connection road to the A113 and a connecting road to the B96a and A111 (the contract involves the construction of 19 bridges). The new section of the motorway opened on 23 May 2008 and gives the new airport full connectivity with the German motorway network. In addition, construction of the high-speed ICE train station located underneath the terminal, which can accommodate two ICE trains at one time, started in October 2007. The six-platform station (two city and suburban tracks and four long-distance platforms) is being constructed by Capital Airport BBI on behalf of Deutsche Bahn. It is 405m long and 60m wide. Other companies involved in the station construction are Schalerbau Berlin, Berger Bau, Bleck and Sohne Hoch-und Tiefbau and Ingenieur Gesellschaft. An express train connection can transport passengers into Berlin city centre in under 20 minutes. The city will be only 30 minutes away by car or shuttle bus. The BBI will allow Berlin the distinction of being the European capital with the shortest distance to an international airport. 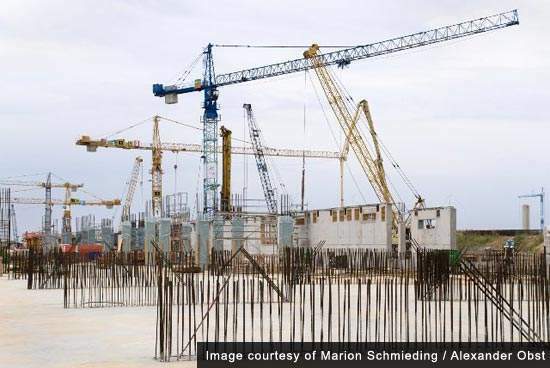 The airport is being constructed to serve an initial 27 million passengers a year, with the possibility of undertaking additional expansion work to increase that number to 40 million by 2030. The BBI is also planned to have an airport centre, which will contain a range of hotels, retail areas, cafes, bars, restaurants and conference centres. 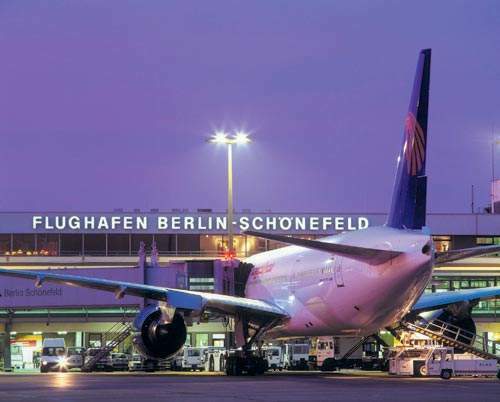 Part of the complexity of the project has surrounded the reluctance to privatise Berlin Brandenburg Flughafen now known as Flughafen Berlin-Schönefeld (FBS), the owner of Berlin airports. The company was set up as a publicly-owned operation, with the majority of shares going to the government of Brandenburg (37%) and the authority of Berlin (37%); the rest is held by the federal government (26%). The conclusion to the negotiations came in November 2002 when the investment consortium, Berlin-Brandenburg International Partner (BBIP), led by IVG Holding (Flughafen Wien, Deutsche Bank AG, Caisse des Depots) and Hotchief Airport, offered to buy 100% of the shares for a consideration of €290m. The BBIP consortium also agreed to provide a total of €650m of capital and to acquire any additional land needed for the airport expansion. The plans called for €1.7bn to be invested, including technical equipment. 75% of the required services were opened for bids to encourage competition. The federal government agreed to bear the costs for the railway (€496m) and road infrastructure (€76m). In addition, the plans called for several villages to be displaced. The government agreed to resettle the people of Diepensee (300) and Selchow at a cost of €32.7m and €81.8m, respectively. The airport concession period, as part of the build operate transfer (BOT) agreement, is 99 years. 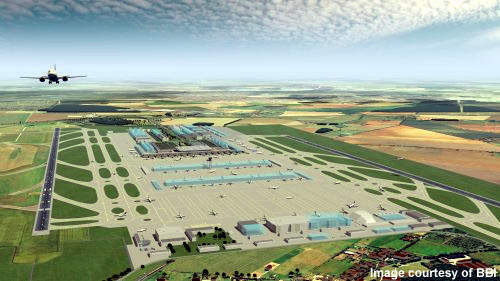 To prevent any problematic dealings with this airport expansion an independent organisation, Transparency International Deutschland, was appointed to oversee all further business dealings. 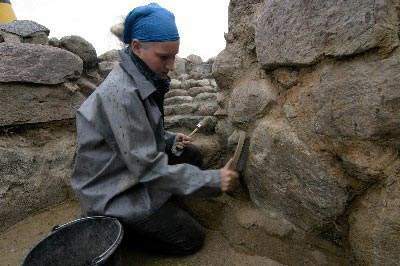 The village sites have been occupied by archaeologists contracted to dig for any important findings before the site is lost forever beneath runway construction. A 1.9km seepage basin has been constructed south of the current airport to handle wastewater from the construction site and prevent contamination of the groundwater. A schedule has been set for the construction. In the latter half of 2006 the activities included the set-up of the construction site; building of the construction roads; set up of the central concrete mixing plant; set up of the construction site areas; beginning of the relocation of lines; request for tenders for the initial construction work and the building of the runway connections to the northern BBI runway. The contract for the construction of the southern runway and aprons was awarded to EUROVIA in August 2007 and construction began in September 2007 (involving 1.4 million square metres of aviation surface). 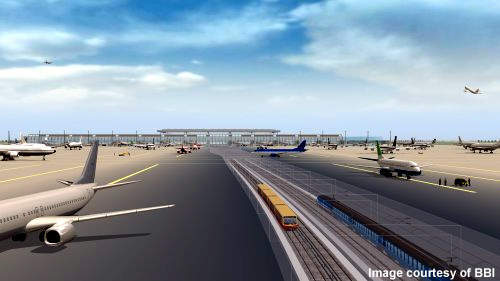 Work in 2008 included the start of the terminal building (started construction in July 2008) and operational roads construction, and demolition of the current northern runway (new runway will be 4,000m). Underground railway station expansion, construction of the DFS airport tower and structural work of the railway tunnel were undertaken in 2009. The fire department commenced operations in 2010 along with a new building for handling equipment and providing winter services. In February 2012, trial operations commenced at the airport began. Noise protection system was installed and a new visitor centre was opened in mid-2012. 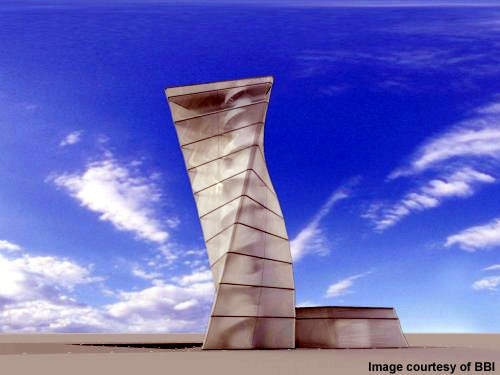 BBI airport will feature a new control tower operated by DFS Deutsche Flugsicherung (DFS). The 72m-high tower was designed by German architect Franz Ondra. Construction of the tower started in April 2007 and was completed in April 2012. The tower is expected to begin operations in 2013. The tower features the latest automation systems with an ergonomic and flexible console. Different air traffic management units can be integrated into the console, depending upon specific requirements. DFS has installed its radar data processing system called Phoenix in the console. The system displays both the air and ground situation and weather data. 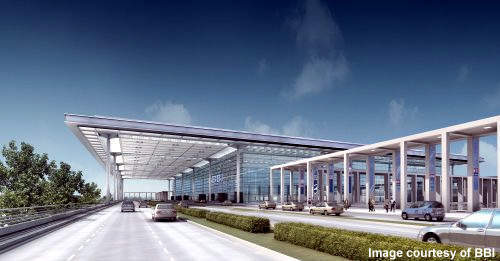 The terminal is being designed by JSK International Architekten und Ingenieure, Generalplanungsgesellschaft and IGK-IGR Ingenieurgesellschaft Kruck. The building will have a total floor space of 220,000m². There will be seven levels with two underground levels for railway infrastructure (U1 and 2). The ground floor, E0, will be for arrivals and baggage claim, level E1 will be for departures, check-in, security and retail, level E2 will be for waiting rooms and offices, level E3 for lounges, and finally level E4 will be a terrace for passengers. There will be four check-in islands with 80 desks, as well as over 200 self-service machines and the required bag drop-off points. There will also be 40 security monitoring points checking prior boarding cards (internet check-in). OCEM has supplied airfield ground lighting (AGL) and power systems for airports since the early days of the aviation industry. 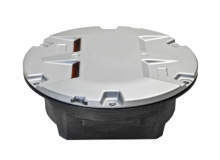 The new LED Inset Runway Guard Light, LITG by OCEM Airfield Technology has all the features the market could ask for runway guard light. 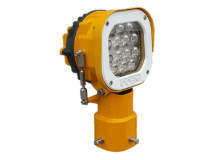 The new LED elevated approach signal LERA by OCEM Airfield Technology has all the features the market could ask for in approach lighting.